I took a short break from Halloween lunches and gave Rosie a pretty flower lunch. She's been out of sorts lately and I thought something pretty in her lunch would be cheery. She didn't eat everything and left pretty much a small amount of each item. When I look back at it now I see that it was likely too much food. Smaller portions tomorrow! Ok maybe they aren't so spooky - more like fun Halloween lunches! These are form last week. cheese sandwich with a cheese jack o lantern topper. I used an upside down mini bird cutter to make the mouth, stamped side by side. She has all of the same ingredients except for the sandwich. Her sandwich is ham and I made a witch's hat, a bat and a black cat. This was all from one sandwich as the hat leaves a bit of extra bread around the edges. Everyone has been getting Halloween jokes in their lunch boxes lately. This one is a free Halloween printable from Paper Glitter. I added the text jokes myself (google Halloween jokes for kids - there are tons) or you can go here and find ready made joke cards that you just have to print and cut. I recommend using index card stock for the best result. Also - I don't actually put the joke in with the food either - that was just for the photo. I usually put it on top of her lunch container. Amy can read her own jokes and Rose usually has one of the older children read her joke. They look forward to their joke everyday! Almost everything was eaten out of these lunches! It's a spooky spider! The girls had fun making these toilet paper roll spiders yesterday morning. I saw this Halloween craft last year on this blog. It was super easy and I only offered slight direction. We used a glitter medium and mixed it into the black paint to make black glitter paint. It's still sparkly and a bit neater than shaking glitter around. We were out of glitter glue, but you could use that also to make it sparkly without the mess of loose glitter. This was a minimally supervised craft so I was making it as easy as possible. They were working at the kitchen table and I was cooking in the kitchen. 2. Have a grown up poke four holes on each side to thread the pipe cleaners for legs. 3. Thread the pipe cleaners through the holes and bend to make it look like legs. 4. Glue on googly eyes and any embellishments that you want - we got out our collage art box and then everyone decided to put lots of extras on their spiders! Here they are adding the fun bits. They started to look less like spiders after a while! Heidi concentrating on her glue - I love it! Amy decided that hers needed a stinger like a scorpion. Rose thought feathers would be just the thing for her spider. Usually we use an art tray when we work with the collage box materials. There was a slight mess on the table but they packed it away and then swept the floor. The art tray definitely contains the mess better. I was busy making pumpkin pie at the time and I just didn't think to get out the art trays. Heidi finished first (top photo) then after she saw what her sisters were doing, she added some more embellishments :) Here are all three finished *spiders*. I found some more unposted lunches form the summertime! I believe these were from a swimming lesson day when they ate these early, right after swimming lessons. 2 mini pita pocket sandwiches - one is tuna and one is chicken salad, watermelon, grapes, carrot sticks and cucumber stick. I can't remember what was in the little cup. Likely it was ranch dip or vitamins! And if I remember correctly she didn't like the naan bread! I already knew she wouldn't eat the mini pita pockets or the tuna, or the chicken salad which is why hers is different in the first place. Oh she's very choosy my little Amy! my whole camera card now and see if I can find any more! More Halloween fun lunches for the girls today. Emily was up playing in the middle of the night last night and my husband and I were both really tired this morning. Lunches had to be super fast and easy. Here's what I came up with. The ghost rings were one of a few fun Halloween trinkets that I found at Party Plus on the weekend. Amy's is the same as Rose's. Just a different cheese and no mustard on her sandwich. The cookie sure looked lonely in that compartment all by itself but there has been a little bit of uneaten food coming home lately, so I didn't want to overpack again. Heidi had a cookie, grapes, apple pieces and a cheese pizza. Everyone ate all of their lunch except Amy, who left some cheese. I made the girls a Halloween themed lunch. I don't usually end up doing too many Halloween lunches since school has often been out for midterm break right around Halloween. This year Amy & Rose will be going to ballet camp over the break so I should have plenty of opportunities to make some more Halloween lunches. These are Rose & Amy's first Halloween lunches of the year. These lunches were gobbled up! Emily is one! I can't believe how fast this year has gone. It seems like just yesterday she was a teeny tiny baby keeping us awake at night. Here are some photos of her birthday party. We had a cute bugs theme. She had a blast! It was a small, family only party on a budget. My Mom and Aunt helped me get organised on the day and my cousin came and put up the decorations for us :) No matter how small the party is, it always seems like a lot of work when there are 4 little ones underfoot and very excited! I am very thankful for the extra help. I made these cookies on Saturday. I must say that a made a bit of a mess in the kitchen but it was fun and I think they came out so cute! I used 20 second Royal Icing from Sweet Sugarbelle and the mess was from making all of the different colours and trying to bake and decorate cookies with so many little helpers. The party food was very simple: assorted sandwiches, veggies and dip, fresh fruit, malasadas (which are yummy Portuguese Doughnuts that my mother in law made -- THANK YOU! ), cupcakes, birthday cake, cookies and some chips and salsa. 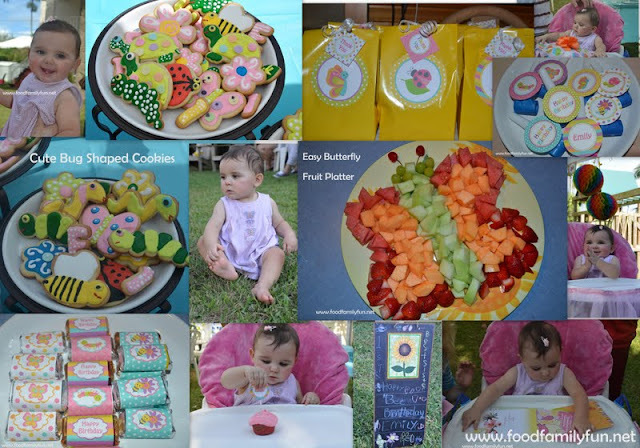 A few weeks ago I was browsing the internet for some fun party food ideas. I came across a fruit pizza shaped like a butterfly on Hungry Happenings blog. I didn't want to make that but I thought it would be a perfect way to display some fresh fruit. I really just freehand arranged the shape and didn't use any sort of template. The theme was cute bugs and I used some party printables from Cupcake Express to decorate and add a few special touches. These are the party bags, blowouts and Hershey's miniatures that I made using the printables. There really are so many things that you can do with the printables set but I didn't get a chance to make a full use of the files this time. I also made a nice banner and some cupcake toppers. I have a lovely photo of the cupcake toppers but there was an icing fail on the cupcakes. I almost didn't post the photo but it's too funny not to share. It was a very hot and humid day and for whatever reason my pink cherry, super delicious icing started to slide right off the cupcakes! I never got a before photo -- so here's an after. I tried to rearrange and put the "best" ones in front. It was only downhill from this point. haha. The ones that semi-survived were very yummy! Here's the birthday girl enjoying her very own cupcake! She was very happy all afternoon.